1989 marks the unraveling of India's 'Nehruvian Consensus' around the idea of a modern, secular nation with a self-reliant economy. Caste and religion have come to play major roles in national politics. Global economic integration has led to conflict between the state and dispossessed people, but processes of globalization have also enabled new spaces for political assertion, such as around sexuality. Older challenges to the idea of India continue from movements in Kashmir and the North-East, while Maoist insurgency has deepened its bases. In a world of American Empire, India as a nuclear power has abandoned non-alignment, a shift that is contested by voices within. 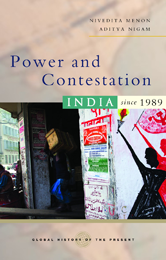 Power and Contestation shows that the turbulence and turmoil of this period are signs of India's continued vibrancy and democracy. The book is an ideal introduction to the complex internal histories and external power relations of a major global player for the new century.